Central Asian food like Uzbek, Kyrgyz or Kazakh cuisine is something you don’t usually encounter abroad not even in big cities. Not sure what the reason is, my guess is it has something to do with what makes Central Asia unique: the mixing of cultures. 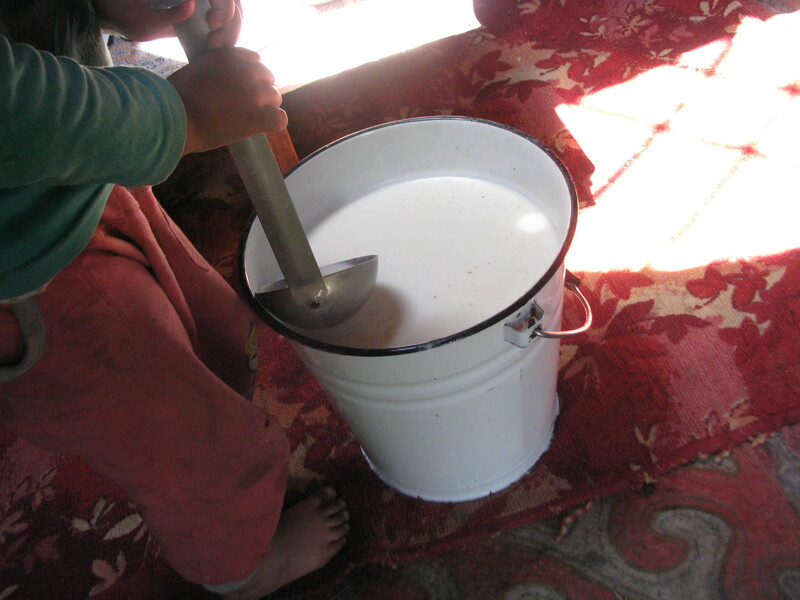 Central Asia was always a mixing pot between East and West. Alexander the Great conquered parts of it, the Romans used the Silk Road to trade with China, afterwards you had the Arabs trading horses and other goods plus a strong Persian influence from the South and of course China from the East. What you get out of this? A cuisine that mixes everything – both exotic and familiar. Let’s look at a couple of dishes eaten across the regions and all countries. Of course every country has it’s own special dishes and local variations are fun to explore. But let’s focus on the staples. 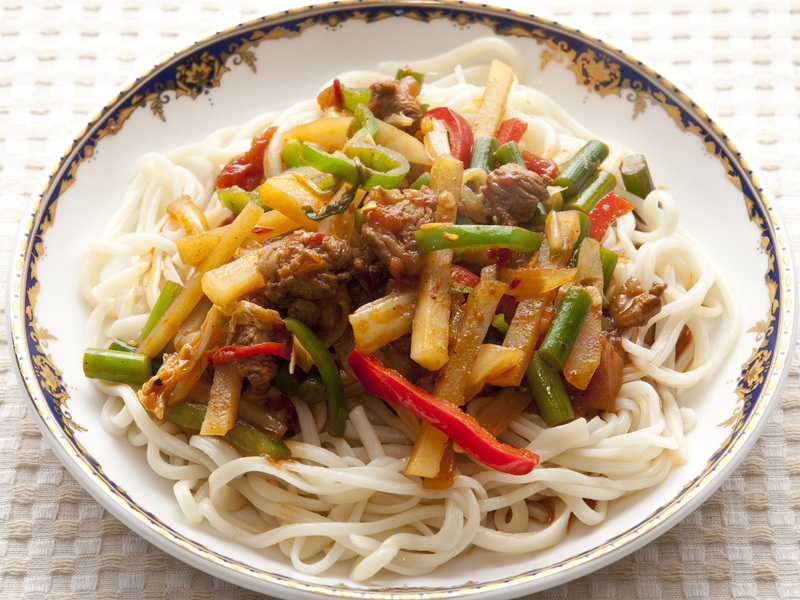 The name Laghman comes from the Chinese Lamian, hang-pulled noodles. That is indeed the main ingredients even if the noodles are thicker than typically in China. The variants on it are endless, from a soup like consistency to something closer to Western noodle with a thick sauce. The meats and vegetables of Central Asia dominate here: you are more likely to get lamb or mutton with peppers and lots of cumin than any typical Chinese version east of Xinjiang. Horse is a key part of Central Asian history, both for the nomadic lifestyle in the mountains and steppes as well as the silk road trade, which brought large Arabian horses to China to be used by Generals. (Normal soldiers had to make due with the smaller Chinese horse, about the size of a pony). Of course that also means horse meat is a staple and used in many different dishes as well as in sausages. 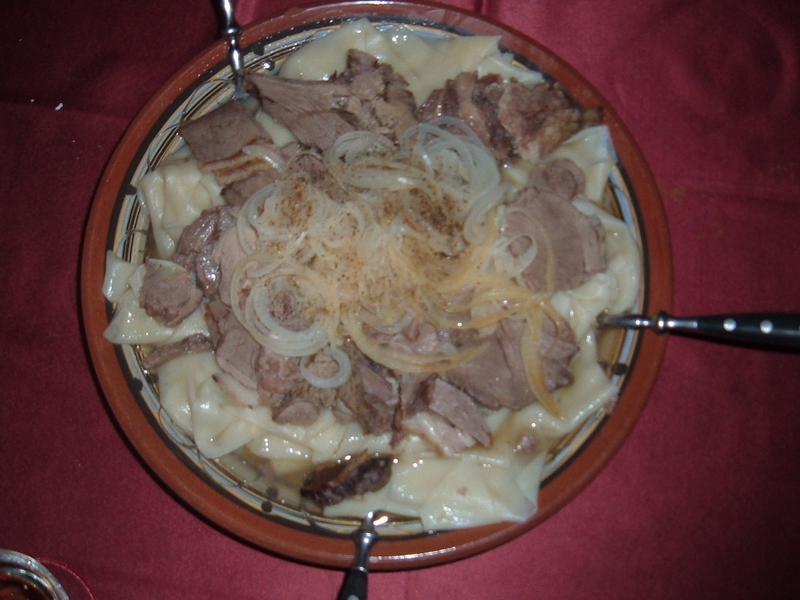 One of the most common dishes that is almost always made from horse meat is Bashbarmak, large chunks of horse meat in a strong sauce over noodles. Not all too different from Laghman, it’s mostly about the emphasis: Laghman is about the noodles, the meat is there as flavor. Beshbarmak is all about the horse meat, the noodles are just carbs. 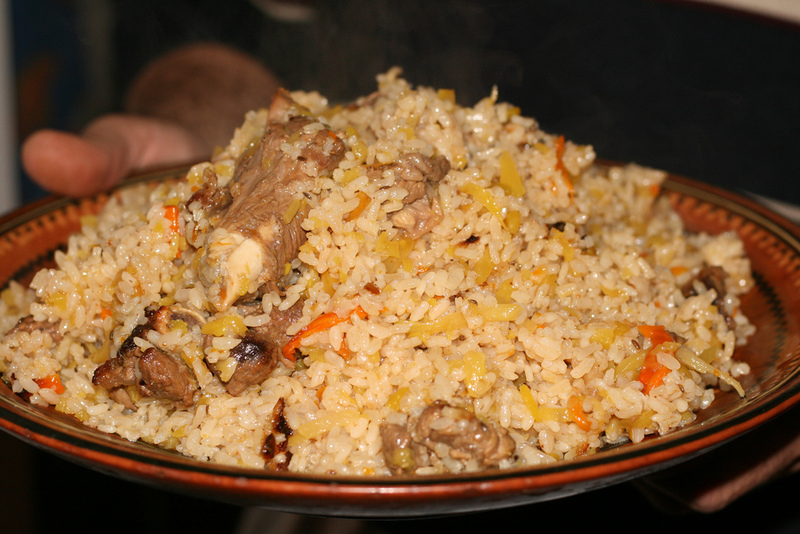 Plov is flavored rice cooked in a broth with meat and vegetables. It represents the Middle Eastern influence on Central Asia, similar to the Persian pilaf and other dishes eaten across the region. What’s different about the Central Asian version? I’ve eaten so many different varieties and they seem to all be prepared differently. It’s less of a dish then a concept. When staying with a local family, the easiest way to get your landlady excited is to ask for Plov: her way to shine with her personal variations of the dish. Oh Manti, I could never get enough of them. 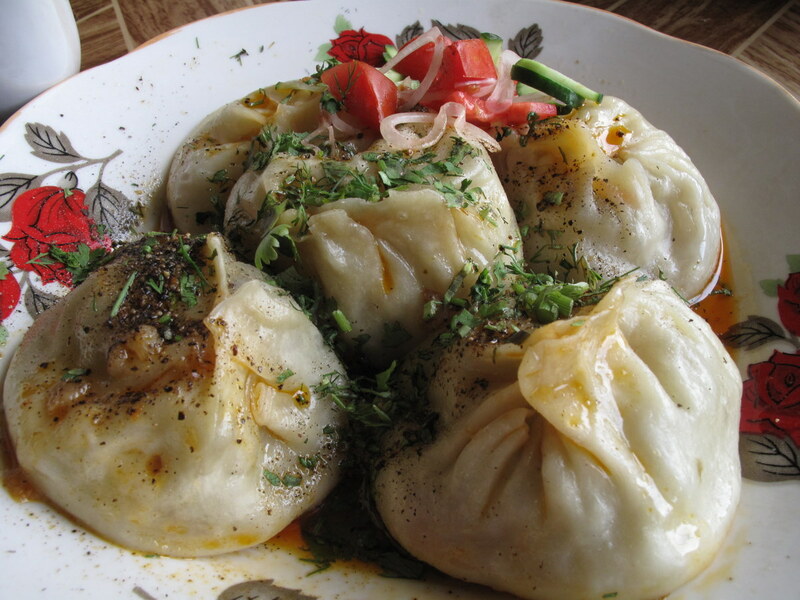 They are the perfect representation of Central Asia: Part Chinese, as in being an oversized steamed Chinese dumpling, looking like a Xiao Long Bao three times its normal size. And part Middle Eastern, as in usually filled with lamb, occasionally potatoes or pumpkins and with a heavy does of sour cream on the side. 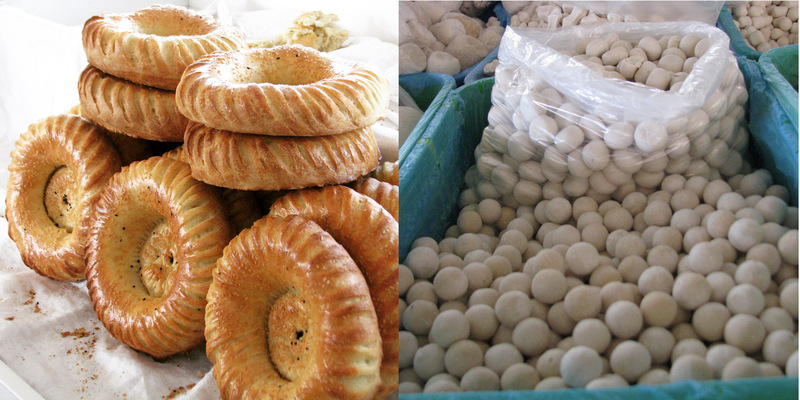 Bread is so important in Central Asian cuisine that you are usually never very far from a bread seller as soon as you see any form of human life. And for good reason, it’s delicious. Resembling a very large bagel without a hole it tastes like a mix between a soft white roll and – yes – a bagel. One the road, it’s available at every stop, together with Qurt. Qurt is more of an acquired taste, it’s dried cheese balls. Dry as in rock hard dried cheese power that gets soft after you had it in your mouth for a while. As it is extremely salty it takes a couple of tries to appreciated it. As travel food it is perfect, it will never go bad and fits well with the bread.